The author describes how he joined the French Foreign Legion, without being able to speak any French and very close to the age limit. He takes the reader through the vigorous selection procedure, the relentless recruit regime and then elite Second Parachute Regiment's training in Corsica. We learn about the ethos and strict discipline of the Foreign Legion. He describes his fellow legionnaires drawn from many backgrounds and nations.Having won his kepi and paratroop wings he served across Africa and the Middle East, taking part in Operation DESERT STORM (fighting Saddam Hussein's Republican Guard), peace keeping operations in Sarajevo and Bosnia and in former French colonies such as Chad and the Central African Republic. 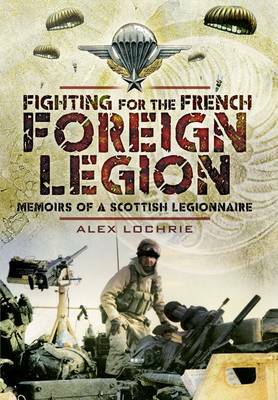 He graphically describes the action and appalling conditions of the local population.Accounts of life in the modern day Foreign Legion are rare indeed and this one written by a mature and modest man makes fascinating reading.Alex Lochrie has had a varied and colourful career. He has been a Police officer, Forensic Scene of Crime Examiner, a commercial artist and a rally driver. After leaving the French Foreign Legion he started his own graphic design business. He lives at Troon, Scotland. Alex has published two novels 'Deadly Black Rain' and 'The Real Cost of Terror' which are available as e-books.